I saw one of these hybrids in our yard yesterday pictured in the first photo. This butterfly could be classified as the Red Spotted Purple except for the two white spots on the outer front wings. Another hybridization of the two subspecies photographed a couple of years ago. 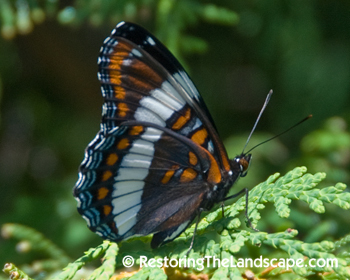 The White Admiral has a broad white band and is darker in color. This butterfly was photographed in the Boundary Waters near the Canadian border. 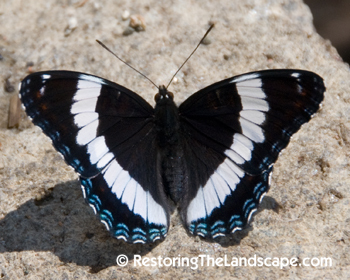 The side profile of the White Admiral with its white band. 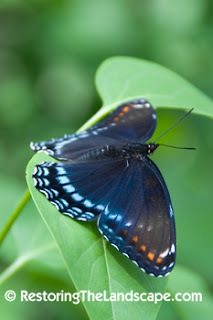 The Red Spotted Purple is similar except the white band is absent. 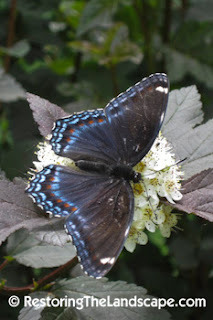 The major native foodplant for the White Admiral is Birch and Poplar trees and the Red Spotted Purple prefers Cherry trees.